Rev. H. C. Brewton, 23 May 1852 - 1 May 1934. Mattie J. Culpeper and H. C. Brewton on 20 Jul 1882 in Early Co., GA.
+ Arva 0. Brewton, Wife of J. D. Brewton, 2 Jun 1883 - 26 Feb 1963. Mrs. Mattie J. Brewton, wife of Rev. H. C. Brewton and daughter of Mrs. J. M. Culpepper, died Sunday in Elko, Houston County where her husband was pastor on the Methodist Church. Was 43 years. Leaves husband, 3 sons, 3 daughters, aged mother, 4 brothers and 2 sisters. Mattie J. Brewton (1st wife)(Martha Jane Culpepper), 30 Sep 1859 - 16 May 1903. Biography* � John Butler Culpepper wrote in a family summary: Carrie, as she was lovingly called, never married, not due how-ever to lack of chance but her undying love for her parents. She was called an "old maid" by the world yet those who knew her best loved her most. Her nieces & nephews were especially fond of her & it was largely due to her kindness & tact that the grand-children loved to go to the "old home" where so many delightful Summers were spent. The stories she would tell, the fun made possible, the laughter created, the rivalry for her love she injected & the confidence she inspired will out-live her generation & will be told to the children of those children who never think of their childhood without aunt Carrie - her words & her ways coming before them. Carrie Culpepper, Head, F, 70, S, GA/GA/GA. Nancy Caroline Culpepper, 6 Sep 1861 - 1 May 1939. Frances Rodgers, 15, F, GA.
[The actual census images on microfilm, and as reproduced on the Web, have a spurious page inserted between the first three names in this family (at the bottom of Page 643A and the last three names (at the top of Page 644A). The error can be seen by inspecting the Family Number.]. Carrie Culpepper, Daughter, F, Sep 1861, 38, Sng, GA/GA/GA. Lucinda O'Daniel Culpepper, Wife of Dr. J. M. Culpepper, 18 Sep 1825 - 31 Jan 1910. George B. Culpepper Sr, Head, M, 44, Md3-17 yrs, GA/GA/GA, Real Est. Agt. Carrie C. Culpepper, Sister, F, 49, Sng, GA/GA/GA. Geo B. Culpepper, Head, M, 53, Md, GA/GA/GA, Insurance Agt. Carrie Culpepper, Sister, F, 58, Sng, GA/GA/GA. Carrie Culpepper, d. 1 May 1940 at 78 years in Peach Co., GA. This brings me to March 29, 1866, the Time, and to the Lindsay Place at Joiner's Courtground, Taylor County, Georgia, the Place, when and where a son was born to James Marion Culpepper and Lucinda Brooks Culpepper, the fourth son and eighth child. This son was given the name of George Bright, after his great-uncle, George Washington Culpepper, and a Methodist preacher named John Bright. 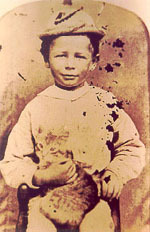 This son was baptized in infancy by Reverend Wyatt Brooks; joined the Methodist Church at old Turner's Chapel on Pleasant Ridge in Macon County, Georgia, when he was 12 years old during the ministry of Reverend John M. Potter; was licensed to preach in Mulberry Street Church in Macon, Georgia. He was not a member of Mulberry Street; but of Centenary Church, Macon, a daughter of Mulberry. Reverend W. F. Smith was pastor of Centenary; Reverend T. R. Kendall was pastor of Mulberry and Reverend John B. McGhee was the Presiding Elder of the Macon District. The license was dated in November 1886. 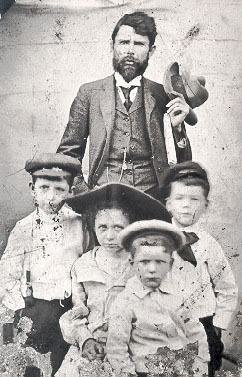 The following year, 1887, he was Manager of the Methodist Orphans Home, located in Macon, Georgia, and also went with his brother, Reverend John B. Culpepper, to the following places doing some evangelistic work: Louisville, Ga; Liveoak, Fla; Ocala, Fla; Madison, Fla; Muskeegee, Ala; Opelika, Ala; Uniontown, Ala; West Point, Ga; Hawkinsville, Ga; Paducah, Ky. At the close of 1887 he decided to go with his brother for the next year, 1888; and started the year with that intention, having gone to Jacksonville for the last meeting of 1887. From now on my part of the Culpepper history, dealing with myself and children and grandchildren, will be written in the first person. I am now 76 years old. I have been married three times; as follows: On the evening of April 11, 1888, I was married to Miss Carlotta Belle Harper in old Centenary Church, Macon, Georgia, Reverend John B. Culpepper officiating. My brother and his wife and my wife and I went in May to Cave Springs, Georgia, and conducted a meeting for Reverend B. F. Fraser. From there we went to Glen Addie, a suburb of Anniston, Alabama, where we conducted a meeting for Reverend S. P. West. Just before Cave Springs we went to Greenville, Alabama, and conducted a meeting for Reverend G. W. Roper. From Glen Addie Church we went to First Church, Anniston, to assist Reverend Alonzo Monk, in a revival. Here I received a wire that my wife was ill and for me to come at once. Our wives had gone to visit sister, Mrs. H. C. Brewton, at Cataula, Georgia. I met them in Columbus, and we went to my father's home in Butler, he being a doctor. There on August 11th, just four months after my marriage, my wife died of typhoid fever. I had decided to enter the Annual Conference and did so in December of that year, 1888, at Eastman, Georgia, Bishop W. W. Duncan presiding. I was assigned to the Marion Circuit for the year 1889 - embracing territory in Marion, Webster, and Chattahoochee Counties. In December of that year, on December 18th, I was married to Miss Ida Kate Merritt, daughter of Reverend W. B. Merritt, a local elder living near Dranesville in Marion County. Bishop Key had transferred me to the Northwest Texas Conference and on the morning of December 23, we left Macon, Georgia, for Lorena, Texas, which town was 13 miles south of Waco. Here the next October, there was born to us a son. We gave to him the name of William LaFayette - after the brother of my wife and my own brother. This son only lived about six weeks; and is buried in Lorena cemetery at Lorena, Texas. At that Annual Conference I asked for a transfer back to Georgia and returned to the South Georgia Conference. That took us to 1891 and we were sent to the Taylor's Creek Circuit in Liberty County, Georgia. At the close of that year I was assigned to the Richland Circuit - composed of the churches at Richland, Weston, Preston and Parrott. This year in March a daughter was born to us and we gave her the name of Catherine Carlotta. My wife contracted pneumonia and died in April of 1892, and is buried in Richland, Georgia. In June of that year the little daughter died and is buried beside her mother. She was three months old. On the Taylor's Creek Circuit, the year before, I had met a young and beautiful widow, Mrs. Lillian Mattox Sheppard. She was the widow of Reverend J. E. Sheppard; who had died while I was in Texas in 1890. Her maiden name was also Shepard; but one family used two p's in spelling the name and the other family used only one. In October 1892 my sister, Mrs. H. C. Brewton, persuaded me to go with her down to Tattnall County Campmeeting. This was in the month of October 1892. The father of the lady I had gone so far to see lived in Reidsville, Tattnall County, Georgia, and the lady was an assistant in the school in that town. My brother-in- law went over to see the family on Friday before the 4th Sunday in October. After a very pleasant visit, we returned to the town of Belleville where lived the sister of my brother-in-law, went to campmeeting Saturday, and on Sunday Mrs. Sheppard came to the campground and by previous arrangement went to the tent of Mrs. D. M. Bradley (sister of H. C. Brewton, my brother-in-law) for dinner. I persuaded her to allow me to take her to her home in Reidsville in the afternoon and I told her why I was there to see her. She listened but objected that she was never going to marry again; and she was so definite that she would not even agree to correspond. I left Belleville on Monday and went back to my circuit, a very much disappointed man. On the following Monday my sister, Mrs. H. C. Brewton, sent me a letter which had been sent to her in Lumpkin, Georgia. This letter was from Mrs. Sheppard and said, after consideration, she would correspond with me if I so desired. I so desired. I commenced the correspondence that day. The courtship progressed until, on the 25th day of December, 1892, in the home of Mrs. Belle McDonald, in Brunswick, Georgia, Mrs. Lillian Mattox Sheppard and Reverend George B. Culpepper were married by Reverend Ed F. Cook, now living in Macon, Georgia, (Oct. 2, 1942). My wife was the gift of God to me, for which not in time or Eternity will I be able to show my gratitude. The Annual Conference held in Columbus, Georgia, had already assigned me to the Willacoochee Circuit, the head of which was Willacoochee, Georgia, in Coffee, County, Georgia. My wife and I remained in Brunswick until the last night of December, when we boarded the train for our parsonage in Willacoochee. We arrived there at midnight and were met by one of the stewards, John McCranie. The next day we took possession of the parsonage. There we kept house until the following December. Conference was held in Dawson and Bishop Charles Galloway presided. Wife and I attended. For the year, 1894, I was sent to Hamilton Circuit in Harris County, Georgia. We had a good year and a fine class of people. I asked to be sent nearer Brunswick in order that we might be nearer my wife's people. I was sent to the Waresboro Circuit. I went and looked the charge over and on account of the condition of my health, coupled with the size of the circuit, I decided not to undertake the work, and Dr. Dowman, who was Presiding Elder, relieved me for the year, 1895.... The South Georgia Annual Conference for 1895 was held in Fort Valley, Georgia, in December, and I was assigned to the East Highlands and Midland work, the parsonage being in the city of Columbus where I preached three Sundays in the month and one at Midland. At the end of 1896 I asked for a location. It was granted and we went to live in Brunswick. For the year 1897 I did evangelistic work, running revival meetings at various points in the Conference. After doing evangelistic work through the years 1897 and 1898, I applied for readmission into the Conference and was readmitted and sent to Wrightsville Circuit, surrounding Wrightsville, Georgia, in Johnson County. My wife and I had two children, Marion and Caughey. Went there and started the year's work but I soon found that it was too heavy for me and I asked Reverend O. A. Thrower, the Presiding Elder, to relieve me. He did, and in March of 1899 we went to Butler to live with my mother. I had nothing and found that I would not be able to make a living there for my family. We decided to settle in Fort Valley. I rented a house and went to writing insurance. According to p. 228 of the History of Peach County , in 1898, the George Bright Culpepper family moved to Fort Valley which at that time was in Houston County, GA. This portion of Houston County would become part of Peach County, July 18, 1924. "Reverend Mr. Culpepper retired from the itinerancy for health reasons and served as a local preacher for fifty years. Among his writings was a book he published, King Solomon's Son ". The following is a summary of his work as a minister from p. 131 of Methodist Preachers of GA 1783-1900 compiled and edited by Rev. Harold Lawrence, member of the North GA Conference of the United Methodist Church: 1888 OT; 1890 FC Deacon; 1892 Elder. S. GA. CONFERENCE: Marion Cir. (Columbus); 1890 t/t N.W. TEXAS CONFERENCE t/t/ S. GA. CONFERENCE: 1891 Taylor's Creek (Brunswick); 1892 Richland (Americus); 1893 Willachoochee (Cordele); 1894 Hamilton (Columbus); 1895 Waresboro (Waycross); 1896 E. Highland & Midland (Columbus); 1897 Located; 1898 Readmitted; 1899 Wrightsville Cir. (Dublin); 1900 Located. "Abide With Me," (poem) WCA , v56, n9, 3-2-1892, p.5. "What Is Heaven," (poem), WCA , v55, n27, 7-8-1891, p.5. Mrs. John D. (Dorothy Culpepper) Wingfield reminisced about her grandfather in an 11 Jun 1994 letter: George Bright's sons & daughters were crazy about him.... I liked him. When I was 13 or 14 & was sad because my nose was big... he examined my nose & said I had "a beautiful Roman nose" (I wasn't convinced but he tried to be & it made me feel better). He would sit by the fire & poke it & tell interesting stories & sing. 25 page, typed manuscript, unpublished. Rev. George Bright Culpepper, 29 Mar 1866 - 12 Oct 1948. Correspondence from Dorothy Alice Culpepper (#20589), Perry, GA, to Lew Griffin, 1993. Married-At Centenary Church in Macon, on April 11, Rev. George B. Culpepper to Miss Carlotta Harper were united in marriage; Rev. John B. Culpepper, officiating. Groom is the son of Dr. J.M. Culpepper of Taylor County(Groom is a writer for the newspaper and is called "Zanthippus".). George B. Culpepper and Carlotta B. Harper on 11 Apr 1888 by John B. Culpepper in Bibb Co., GA, Book G-228. p 13 at J. M. Culpepper house but. Harold Lawrence, Methodist Preachers of GA 1783-1900, United Methodist Church, North GA Conference. p 13; loc LDS IGI Batch 8804805 Sheet 79.
p 14 'in the home of Mrs. Belle McDonald' by Rev. Ed F. Cook. George Bacon Culpepper, 4 Dec 1899 - 7 Oct 1972. George Culpepper, Head, M, Mar 1866, 34, Md 7 yrs., GA/GA/GA, Life Ins. Agt. Geo. B. W. Culpepper, Son, M, Nov 1899, 6/12, Sng, GA/GA/GA. p 18 'the Brick House' west side of Knoxville Street. p 21 'the Skellie House' corner of College & Green. Charles Frederick Culpepper, 30 Apr 1907 - 21 Dec 1974 (Wife was Alice Elizabeth Long). G. B. Culpepper Sr., 12 Oct 1948 at 83 years in Peach Co., GA; Res. in Peach Co., GA. Biography* � History of Peach County, p. 228, states that George Bright Culpepper "married Mrs. Lillian (Shepard) Sheppard of Liberty County...."
Lillian Shepard Culpepper, 13 Sep 1871 - 18 Nov 1939. + Mary E. Mattox Shepard, Wife of C. W. Shepard, 31 Oct 1848 - 4 Feb 1929.